Spencer: There’s a common belief that kids raised in sheltered, restrictive environments will go absolutely wild at their very first taste of freedom. I don’t know if the truth is that extreme — I was about as sheltered as they came as a child, and all my rebellions have been rather tame — but there is a lot of truth to the idea that needless restrictions and censorship just hurt people, regressing emotions and hindering growth and in many cases leading to actual physical punishment for meaningless offenses. New Super-Man and the Justice League of China 20 taps into the latter when it introduces its new “Aquaman,” Ahn Kwang-Jo. Kwang-Jo is a brilliant student from North Korea who is interrogated over the “crime” of loving The Simpsons. In response, the agents beat the stuffing out of him. It should be immediately obvious to anyone that North Korea is a fascist dictatorship that is only looking to subjugate its citizens, and this isn’t even close to the depths of the regime’s evil, but the disparity between “crime” and punishment feels especially cruel and pronounced here nonetheless. Kwang-Jo is about an unassuming as they come; his amusement over such a simple joke is, as the kids say, “adorkable,” and clearly not a threat to anything or anyone except perhaps the regime’s ego. These are the kind of restrictions that wear away at peoples’ souls, and the primary two reactions seem to be either fear, or rebellion. Kwang-Jo chooses the first, but is rescued by his jumbo-sized aquatic servants. The Justice League of China, though, seems to have chosen rebellion, breaking away from the corrupt Ministry of Self-Reliance to make a go at it on their own. Writer Gene Luen Yang seems to be making subtle comparisons between North Korea and China, and while the latter allows more freedom than the former, it’s still far from ideal. This creature Sleez is, well, sleaze, but I don’t think he’s entirely wrong here. The people of China have faced (and still face) much censorship and oppression themselves, and are still just getting used to any small freedoms they’ve gained. In many ways they’re better off than Kwang-Jo, but they’re still got a long way to go compared to so many other lands. The Lantern Corps of China reinforces that idea, attempting to arrest the Justice League for the “crime” of disobeying the Ministry (completely ignoring the fact that they just took down a supervillain in the process! ); while the conflict between the two groups is born of government conspiracy that doesn’t as fully impact the lives of every day citizens, it’s still a gross miscarriage of justice. The other major theme Yang and artist Brent Peeples seed throughout this issue is the idea of balance — though I suppose that should be obvious, given that the title character not only wears a ying-yang on his chest, but seems to be quite literally possessed by one as well. What I find most interesting about the way Yang explores balance is the fact that Super-Man seems to completely misunderstand the concept. Kenan’s efforts to find balance have essentially found him trying to be a different person entirely, albeit a better one. I give Kenan a lot of credit for that, since, for my money, putting in the effort to change for the better is 95% of what being a good person actually is (can you tell I’ve been watching a lot of The Good Place lately?). Putting on a new persona or even being a “good person,” though, doesn’t necessarily make you a balanced person. We’ve yet to really see what a balanced Kenan Kong might look like, but I’m eager to find out, especially since I think he and the rest of the Justice League of China are going to need as much even-keeled, reasonable balance as possible. 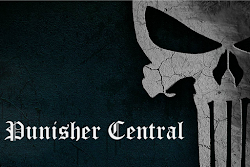 They aren’t just facing Sleez or even the Lantern Corps now — they’re facing the North Korean military as they pursue Kwang-Jo across the border, and that’s a mission that’s going to requite diplomacy more than anything. Diplomacy is one of Kenan’s greatest weaknesses, so it should be interesting to see how he and his new, improved self handles the situation — it’s certainly going to put him to the test. Mark, I’ll admit here that I’d fallen a bit behind on New Super-Man, but jumping back in with this issue I was pleasantly surprised by how much I liked it. Not only is the thematic work strong, but I loved the humor, character interactions, and small details as well (Bat-Man using Robinbot as a snowboard!). Were you pleased with this one? What do you think of our new Aquaman, and about bringing North Korea into the mix? Do you think changing the title of this series has changed anything about the creative team’s approach? 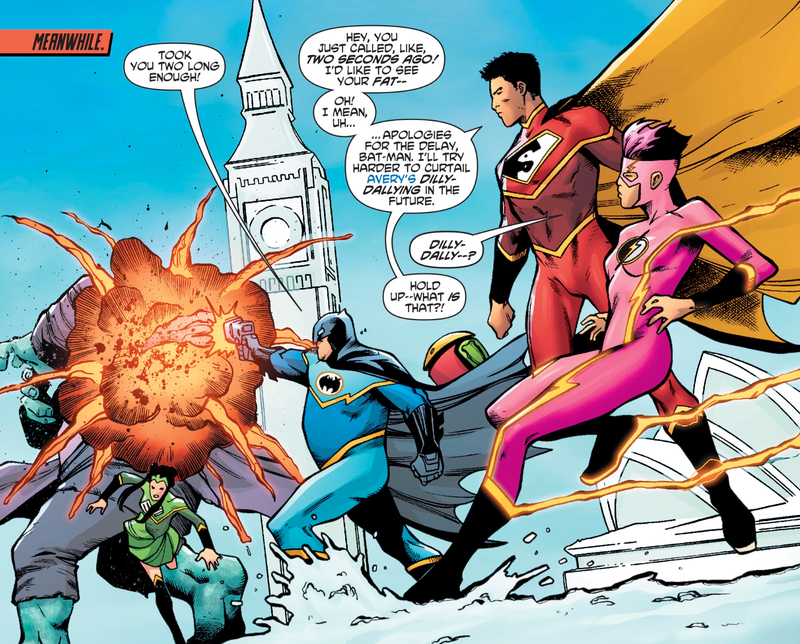 Mark: New Super-Man and the Justice League of China 20 feels like a natural extension of New Super-Man and the book’s gradual refocusing from a solo title with a strong supporting cast to a full on ensemble piece. It’s interesting, though maybe not overly meaningful, that DC opted to carry the numbering of the original book into the rebranding — the issue feels like a good opportunity to entice new readers to check out the Justice League of China. Because, like you mentioned, Spencer, the introduction of the Lantern Corps of China is a great example of Yang’s knack for playfully teasing out DC’s history and using that history to build a corner of the DC universe both familiar and innovative. The issue’s strongest individual set piece is Yang and Peeple’s introduction of (who I’m assuming will be called) Aqua-Man. The single crab leg emerging from the pool of water in the interrogation room was striking and, as an arachnophobe, a little bit skin-crawling. Fitting for a book that centers around the idea of balance and yin and yang, Aqua-Man’s introduction is not just the strongest moment of the issue, but also a victim of its weakest: Yang has a tendency to tell when he should show. The North Korean heavies who remove Kwang-Jo from class and interrogate him in a shadowy room never come across as particularly intimidating because they never shut up. North Korean officials dragging a student from class and hauling him off to a concrete cell is enough to let us know that they’re bad news; dialogue like “The imperialists have an unnatural attachment to comfort. True North Koreans do not” is putting a hat on a hat — and that’s too many hats! 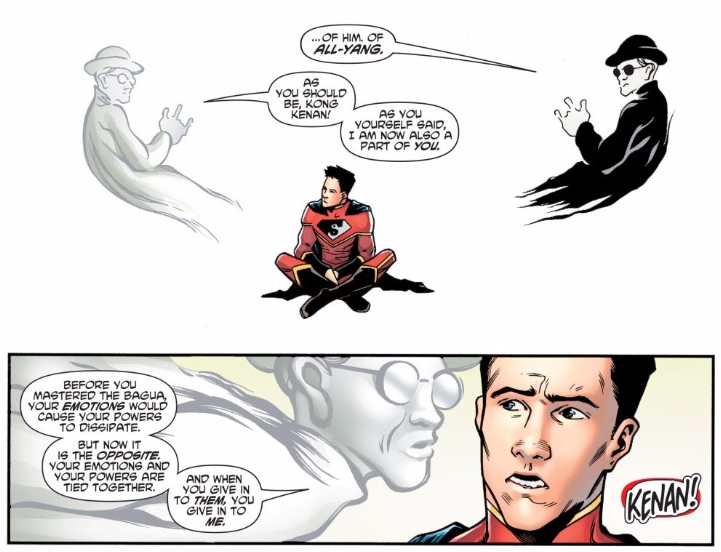 Still, despite the issue’s occasionally inelegant moments, Yang never loses the voice of the book’s central character, Kenan Kong, aka Super-Man. 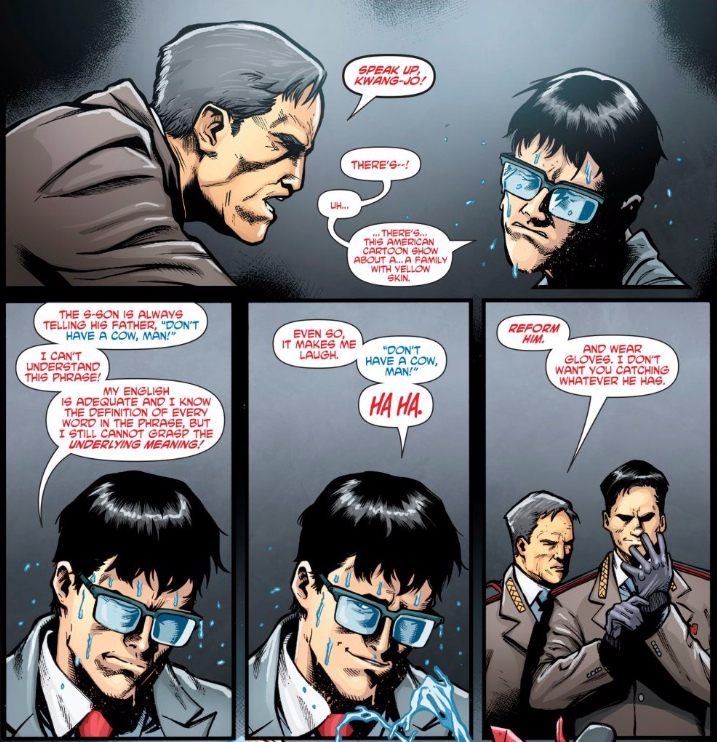 A tongue-in-cheek sense of humor has been a large part of New Super-Man from the beginning, and Kenan’s attempt to be a “good” person illustrates Yang’s ability to ride a joke without wearing out its welcome. 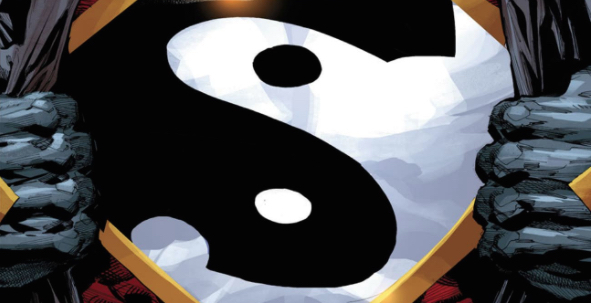 New Super-Man and the Justice League of China 20 is a promising continuation of the New Super-Man story, leaning into the strengths of the original run while expanding its scope. I’m forever impressed by Yang’s cleverness and the reverential way he uses DC history and Chinese folklore to craft something completely distinct. Have DC really introduced Sleez? Did comics really need the return of the character that raped Big Barda and almost Superman in one of the grossest, most horrific arcs ever? And then reference it like it was some cute bit of continuity instead of a story that DC should not be deeply ashamed of? This was the comic that thought it was a good idea to have the racist caricature from the cover of Detective Comics 1, wasn’t it. So this book has a history of taking the most sickening parts of DC’s history and putting it on display. I don’t want to say DC has reached a new low, because things have been horrid for so long that you can’t say that (Doomsday Clock 3 viciously attacking a real person for being friends with Alan Moore and the continued employment of Ethan Van Scrier (and Chuck Dixon, I think) while he is part of a harrassement movement against fellow creators is much worse.